The Customer Item Reference Number functionality allows you to link your own part numbers to ERIKS item numbers. Once you activate the functionality, your own item numbers will be displayed under the ERIKS item numbers on order confirmation documents, as well as on product detail pages in our webshop. Since your own part numbers will be stored in our system, you will be able to retrieve them in your Order history page, and to use them as search terms in the search bar, for finding the desired products easier. Linking your item numbers to ERIKS item numbers can be done in two ways: during the checkout process or through our Service department. To activate the functionality, you need to be logged in with an User Manager account. Under My Account, go to the User Manager page and in Company settings, click on References. In the section "Your item references", activate the functionality by checking the box at the bottom - "Select to make it possible to add article numbers to articles". Click the Save button at the bottom of the page. Once the functionality is activated, an extra input field will be added to the checkout form. 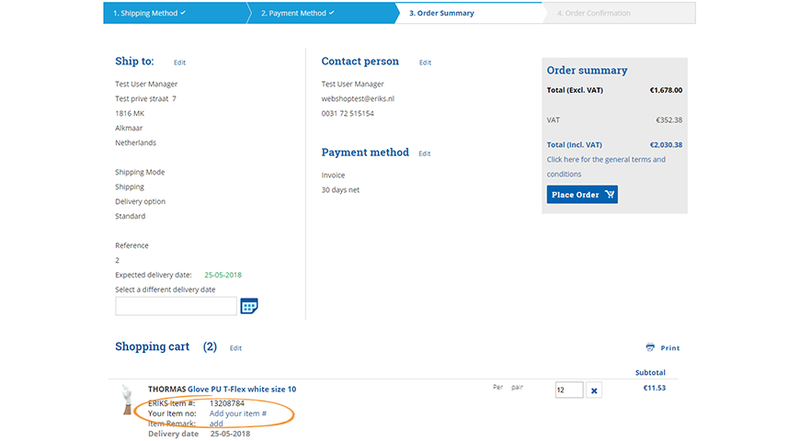 This will become visible in the third step of the checkout process, which is Order Summary. 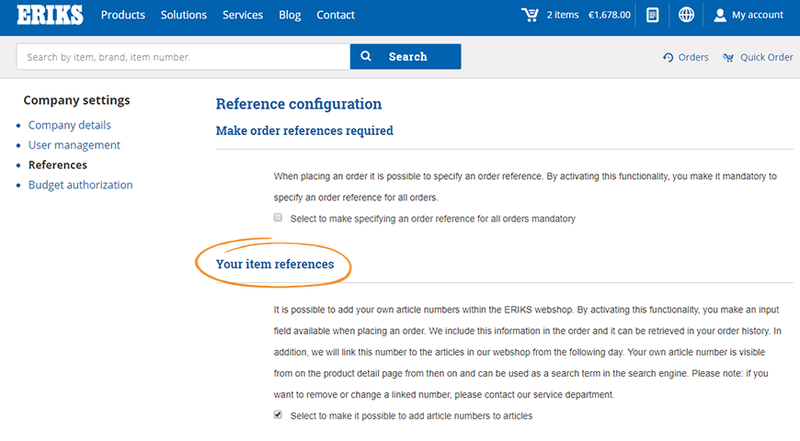 To link your part number to the ERIKS item number, click on "Add your item number" and press Enter. Your Customer Item Reference Numbers will become visible on product detail pages and in your order history within 24 hours. You can also link your part numbers to ERIKS item numbers by contacting our Service department. In this case, you will have to provide your order reference and the ERIKS item numbers and part numbers that you want to link. Our Service department will add your codes in our system, and they will become visible in your Order history and as search terms within 24 hours. NOTE: Please note that for both activation options, if you want to remove or change a linked part number, you will have to contact our Service department. Also, keep in mind that once you activate the Customer Item Reference Number functionality, it will become available for all users registered under your organization’s account. If you have questions about this functionality, don't hesitate to contact us.